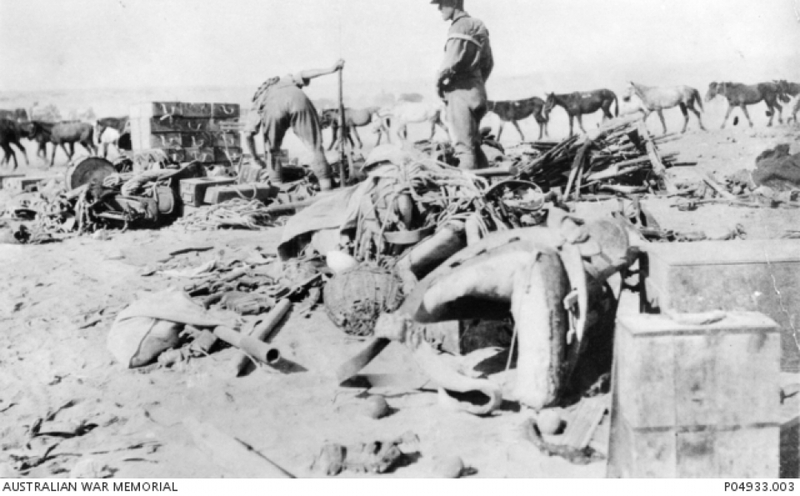 The battle of Beersheba occurred on 31 October 1917 when the town was captured and the British Empire forces were able to advance into Palestine. It was part of the British attack known as the Third Battle of Gaza. Many local men were members of the 12th Light Horse Regiment which particpated in this Battle. Inverell district men believed to have been in this battle were Luke Bice, Lewis Eyre, Thaddeus Victor Green, Cecil Harcourt Grove, Claude William Guyer, Cecil Thomas Hills, Sydney Clare Ellis Johnson, Osborne William Johnston, Samuel Edward McArdle, Alexander Thomas McClymont, Cecil James McClymont, Cecil H McDonald, Quarter Master Harvey McGregor, Sgt William Salmon, Herbert Sullings, and Bingara boys Charles Doherty and Michael James Madden. There may be many more. Alexander McClymont, Sydney Johnson, Osborne Johnston, Cecil Grove and Herbert Sullings were killed in action at Beersheba. Thaddeus Green, Claude Guyer and Cecil Hills died of wounds. 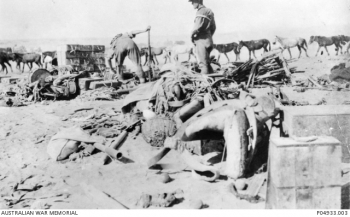 Image: Members of the 12th Light Horse survey damaged items and captured Turkish equipment from the Battle of Beersheba.